The prime minister isn't planning to meet directly with the U.S. president. U.S. President Donald Trump walks with Prime Minister Justin Trudeau and wife Sophie Gregoire Trudeau during the G7 Summit in La Malbaie, Que. on June 8, 2018. Prime Minister Justin Trudeau says the U.S. president's aversion to following rules is a key reason Canada can't budge on a dispute settlement provision in a revamped North American Free Trade Agreement. NAFTA's Chapter 19 allows companies who feel wronged by anti-dumping, or countervailing duties, to have their issues settled by independent panels of experts from the countries caught in the dispute. The chapter has been repeatedly used by Canada to fight U.S. tariffs on softwood lumber. However, U.S. President Donald Trump wants Chapter 19 scrapped. He claims the dispute resolution process infringes on his country's sovereignty. In an interview with Edmonton radio station 630 CHED Wednesday, Trudeau reiterated that the issue is a deal-breaker as negotiations continue this week in Washington. "We have red lines that Canadians simply will not accept," Trudeau said. "We need to keep the Chapter 19 dispute resolution because that ensures that the rules are actually followed. And we know we have a president who doesn't always follow the rules as they are laid out." The prime minister said his government similarly won't budge on exemptions for Canadian cultural industries that protect broadcast and publishing industries from being taken over by U.S. companies. He also pledged to defend Canada's supply management system for dairy and poultry — another issue on which Trump has called for major concessions. But the prime minister noted Canada has shown "a certain amount of flexibility in signing other trade deals." Canada granted greater access to its protected dairy market to secure a trade pact with the European Union last year. Host Bruce Bowie also asked Trudeau if he takes it as a sign of disrespect that Trump often refers to him as "Justin" in public. "I call him Donald. So, there's that," Trudeau said, adding he's used to being called by his first name in public. "I don't really fuss too much with what Mr. Trump decides to call me. That's just not in my nature." 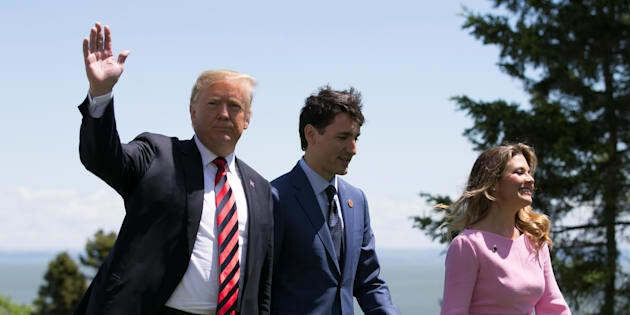 "We are going to continue to negotiate in good faith," he said, adding he believes a "win-win-win" outcome is possible for the U.S., Canada, and Mexico. The prime minister also said he has no plans to meet with Trump directly in Washington while NAFTA talks continue. Foreign Affairs Minister Chrystia Freeland and Canadian negotiators are doing a good job and are keeping him updated, he said. Canadian and U.S. negotiators could not reach a deal to meet Trump's deadline last Friday. Trump raised stakes over the weekend by tweeting that there is"no political necessity'' to keep Canada in a new trade pact, touting a side deal reached with Mexico. According to the White House pool report, Trump told reporters Wednesday that trade negotiations with Canada are "intense." The president also said the U.S. would be fine if a deal can't be reached with its northern neighbour. "It won't be fine for Canada, but we love Canada," he is quoted in the report as saying.